Reach new heights thanks to the Soar Bar Chair from Zuo Modern. This distinct bar chair is offered in multiple dazzling colors, ensuring the piece will complement your modern or retro d�cor beautifully. 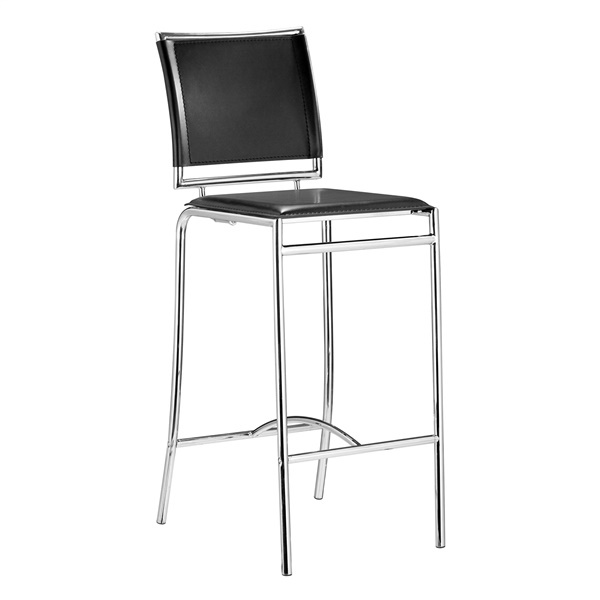 Also, the bar chair features a distinct chrome steel tube frame as well as a plush leatherette seat and back for amazing comfort. When it comes to finding a superb bar chair for your kitchen or dining room, the Soar Bar Chair represents a stellar choice. Includes a solid footrest that makes it easy to relax at any time. Boasts a chrome steel tube frame that offers immense support. Provides a plush leatherette seat and back that deliver superb comfort. What is the height of the chair from floor to the seat? Can these be used at the kitchen counter? The Soar Bar Chair has a seat height of 28.5" from the floor. If you are looking to use it at a kitchen counter, you would need to measure your counter height. Typically you want to have about 12" of space between the seat height and the counter height.